KWV’s first Cape Blend, Abraham Perold Tributum 2010, is my Wine of the Month for September 2016. 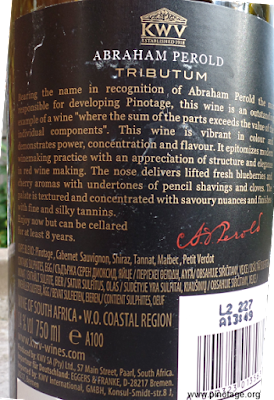 Tributum is a blend of Pinotage (36%), Cabernet Sauvignon (27%), Shiraz (22%) plus 5% each of Tannat, Malbec and Petit Verdot. Grapes were sourced from Stellenbosch and Paarl, hence the ‘W O Coastal’ appellation. The wine was aged for 16 months in 90% French and 10% American oak barrels, 70% of which were new. This wine was a revelation, subtle and sophisticated with intense depth of flavour that just keeps going on and on. Wood offers structure without imposing on rich dark berry flavours with an underlying seam of ground pepper and savoury notes. Deliciously scrumptious. 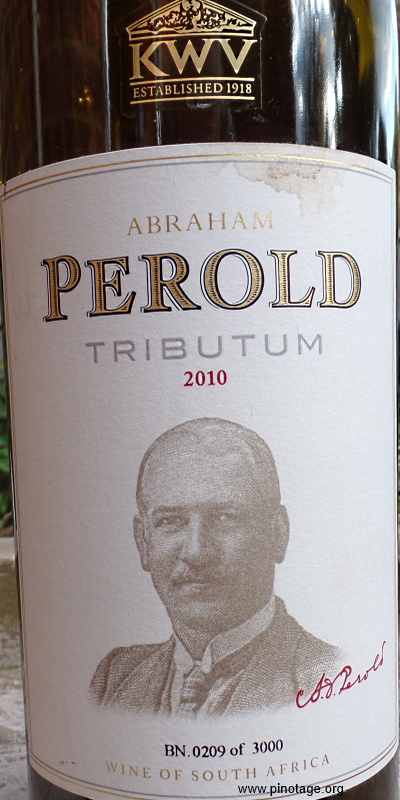 An excellent tribute to A I Perold, creator of Pinotage. 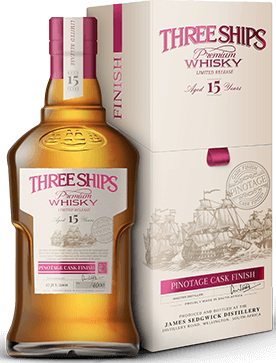 The Three Ships 15 Year Old Pinotage Cask Finish is a blend of 15 year old malt and grain whiskies distilled and matured separately at the James Sedgwick Distillery in Wellington, Western Cape. Both the malt and grain whiskies spent the final years of their maturation in unrinsed Pinotage casks. Only 4,000 bottles have been made, with 500 being sold by online auction on 5 October with the rest being available to buy from 8 October (World Pinotage Day) from the distillery, duty free shops and selected retaillers. 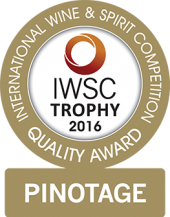 Congratulations to De Wet Viljoen and his team for winning the 2016 International Wine & Spirit Competition Abraham Perold Trophy for Pinotage with Neethlingshof Owl Post Pinotage 2014. 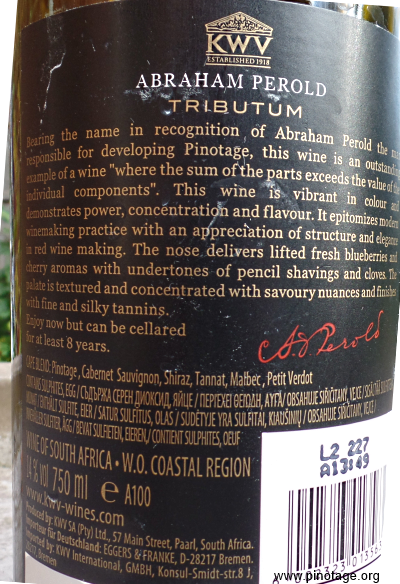 The Abraham Perold Trophy for Pinotage is sponsored by The Pinotage Association. A good showing for Beyerskloof, who won a total of 19 medals. South African Wine Farms were awarded an astounding 30 Gold medals, and 9 Gold Outstanding. Unusually, of all awarded wines, 24% were Silver Outstanding, 53% Silver and only 18% Bronze. Usually the larger proportion are awarded Bronze medals, highlighting how high the standards are for this set of South African wines. Highlights include a Gold Outstanding Diemersfontein Wines for their Carpe Diem Pinotage Reserve, which judges called ‘elegant and classy’. This fun fizz is fluorescent pink and froths invitingly in the glass. 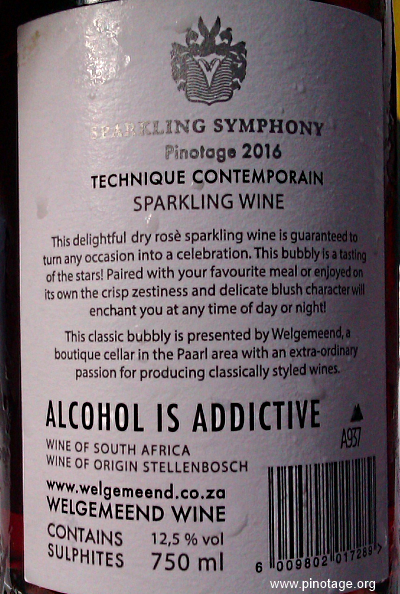 It’s a 100% Pinotage, 12.5% abv, sweet with around 30g/L residual sugar and made by the ‘Technique Contemporain’. Unfortunately the bubbles dispersed almost immediately, and to me a glass without a stream of rising bubbles isn’t a fizz. Despite the back label describing this as a ‘classic bubbly’ Technique Contemporain is Welgemeend’s own name for carbonation. 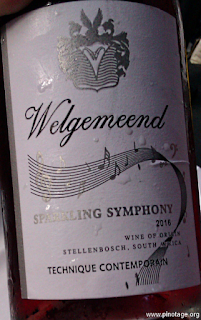 I think this needed more pressure to retain bubbles, but it has no pretensions other than as a party wine and it looks very pretty.